There have been quite a few blog posts lately about taking a break from Facebook. Well, I’m taking a break from writing, social media, and what not. Stay tuned – I’ll be back in a bit… Hopefully with some fresh ideas and some new motivation. There are some projects that need some attention. It’s Monday! Here are some interesting reads from last week. Oh yeah, don’t forget your beverage of choice! Evernote Penultimate Goes Free [Article] – Already a fan of Evernote and looking for a drawing app for you iOS device? Super Mario Busters – A Ghostbusters / Super Mario Bros. Mashup [Video] – Kids these days won’t get it but what weird but yet neat compilation. TPB AFK: The Pirate Bay Away From Keyboard [Video] – Ever hear of The Pirate Bay? Here’s an interesting documentary about the creation, legal battles, and future of The Pirate Bay. Web Servers In A Can: Now In Stock At Mac App Store [Article] – Locally deploy and develop on certain platforms. Similar to MAMP, XAMPP, and other solutions. Advice From A Former Business Student Turned Googler [Article] – Solid advice. Enough said. It’s another Monday and this is being posted too late in the evening… Time got away today. Regardless, grab a beverage, snack, or take a break and catch up on something interesting from last week. 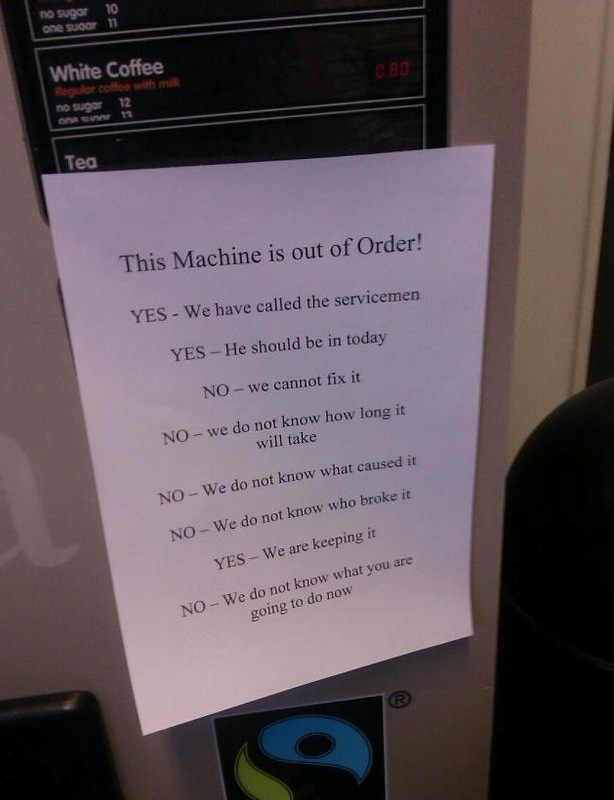 The correct way to put an “out of service” sign on whatever is broken at work… [Image] – Any guesses as to which department posted this? The Right Way to Give Your Boss Bad News [Article] – If there’s time, include the briefcase technique from Ramit Sethi. VIDEO: Our Year in Travel [Video] – An awesome blog about traveling and being an entrepreneur. Peer inspiration! How Did You Poop Before Smartphones? [Video] – Ok, the video is pretty stupid but the title is awesome! Why You Should Work From a Coffee Shop, Even When You Have an Office [Article] – There are plenty of times that I need to get out of the office to take in a different atmosphere. Productivity usually goes up! I’m not quite sure what I would use this service for… maybe for listing out venues or locations for a website. It could also work well with a CRM to map out your clients or potential clients if you’re working with regions. Regardless, it’s pretty neat.